Say no to HB 2718 – No Tolls on 81! Recently, a bi-partisan group of Virginia lawmakers along with Governor Northam, has called for a series of tolls on Interstate 81, with the understanding that these tolls will go towards improvements on I-81. Supporters of the bi-partisan plan state that these tolls are mostly meant to impact on out of state vehicles or trucks which are hauling cross country – and in fairness, the bill’s sponsors have tried to put in safeguards to ensure that the tolls don’t affect local residents who use 81 to get to and from work. The bill in question (HB 2718) states that a fund called the Interstate 81 Corridor Improvement Fund would receive all of the toll revenue, and that this revenue can only be deposited into the “Fund”. Quite frankly, it is hard for me to believe this is the case, as we have been told repeatedly for years time and time again that money raised by tax revenue will only go into certain funds for certain costs, and then either the tax/toll will end. We were first told this in 1812, as the Virginia State House then passed the Business Professional and Occupational License (BPOL) tax was passed to fund the War of 1812. Oddly enough, the BPOL tax is still being charged, and unless I am very wrong, the War of 1812 ended over 200 years ago and surely we have paid the debt for this war by now. However try as they might to shade taxpayers and commuters from the truth, one little fact keeps sticking its head out of the sand, no matter how hard the bi-partisan coalition tries to pound it back into hiding –The largest tax increase in Virginia history signed into law by Republican Governor Bob McDonnell was supposed to pay for road construction all up and down the Commonwealth, including I-81. This tax increase on working families raised the sales tax from 5 to 6%, higher state hotel taxes, and higher state real estate sales taxes. This largest tax increase in Virginia history was supposed to fund both light rail and road construction in several areas of Virginia – including Interstate 81. However we in the Shenandoah Valley and Roanoke Valley and Southside have not seen any of this money come to widen 81. Quite frankly – it is borderline criminal for the Legislature to ask for us hard working taxpayers to once again fund road construction when we have been paying for this road construction for 5+ years and have seen nothing. More surreal is a provision in the bill which would make it an offense to perform something called “toll avoidance”. Meaning that if my mother and I were to go to Lexington for a day trip, and on the way back we stop off to visit her favorite dress shop in Verona, that would be considered a finable offense by the appointed board which oversees toll violations. This is going to hamper local businesses who need the revenue from people traveling up and down 81. This bill as written will be a job killer to small retail outlets who need money the most. And at the end of the day, after having read the bill, there is no guarantee that anything discussed here will reduce traffic on 81. All we may be doing is funding another regional Board of Directors, another government entity. Everyone can agree that 81 is a mess – there are too many trucks on a road not built to handle that many trucks. 81 was originally constructed with the understanding that 15% of its traffic would be trucks or tractor trailers. Best estimates now suggest that up to 30% of the traffic on 81 is a tractor-trailer. There is no perfect solution here, and quite frankly any workable solution would be one which gives pretty much everyone a serious case of heartburn. But requiring taxpayers to pay for something which we are already paying for is unacceptable. And taking punitive actions which would harm local businesses must also be out of the question as well. 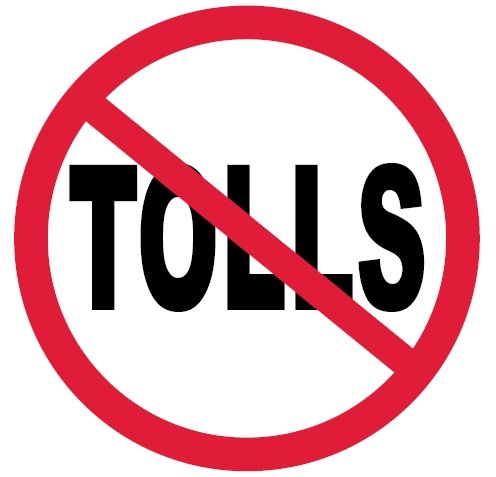 Say no to Tolls on 81 – call your legislators and ask them to vote against HB 2718.